Read more "I'll be in Leeds for the Drupal Global Sprint Weekend, this Saturday"
Happy birthday, Drupal: give a patch for a present on Wednesday! Because the greatest gift you can give someone is quality time. And clean code. And granular commits. 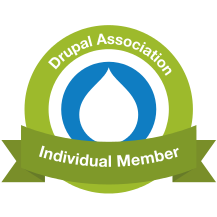 Read more "Happy birthday, Drupal: give a patch for a present on Wednesday!" Thanks to NWDUG for Drupal Camp North West! "... It's the best (vegetarian) food I've had at *any* Drupal event, including Drupalcons!" Read more "Thanks to NWDUG for Drupal Camp North West!"